One of the nicest routes I have cycled is a circular route to Islay and back from the mainland. Having a few days free in October, my son and I decided to take the bikes and head to Islay. 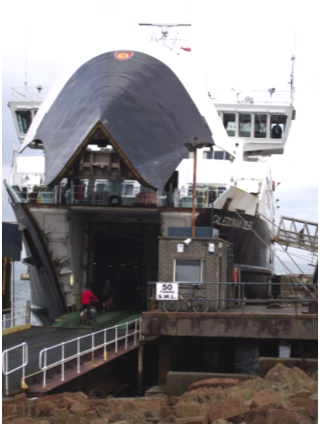 Day 1 – Catch the ferry to Arran, cycle Brodick to Lochranza and stay overnight in Lochranza SYHA hostel – Approx 24 miles. 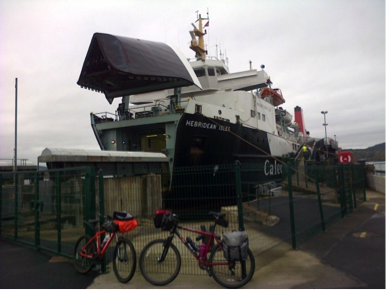 Day 2 – Catch the ferry to Claonaig, cycle to Kennacraig, catch the ferry to Port Askaig on Islay, cycle down through Islay to Port Ellen and stay overnight in Port Ellen – Approx 24 miles. Day 3 – Catch the ferry back to Kennacraig, cycle to Tarbet, catch the ferry to Portavadie, cycle to Colintraive via Tighnabruaich, catch the ferry to Rhubodach on Bute, cycle round to Rothesay and finally catch the ferry to Wemyss Bay where we would be picked up – Approx 33 miles. Seven ferries, three islands and approximately 80 miles….. hopefully a comfortable three day trip with great views, a few memorable climbs and downhills without it turning into a slog! Our drop off point was Ardrossan on the Clyde Coast where we purchased our Hopscotch tickets from the CalMac Office. The weather forecast was mixed but it was dry when we made our way onto the ferry to Arran. The predicted rain closed in as we arrived in Brodick and headed north to Lochranza with the rainwater streaming down the road as we hauled up the main climb of the day from Sannox to Lochranza. The long haul up was rewarded with a fast descent to the distillery just outside Lochranza and hot drinks (but not whisky :-)) in the cafe before booking into the hostel for our overnight stay. We had our own small room, were able to purchase some food which we cooked in the hostel kitchen and there was plenty of opportunity to dry out our gear after the day’s soaking. We caught the small ferry out of Lochranza in the morning and had it all to ourselves as it made its way over to the Kintyre peninsula. A short five mile ‘up and over’ cycle brought us to Kennacraig, the ferry departure point for Islay. Skies were a bit grey but the rain was holding off as we waited to board the ferry. Lunching on the ferry, we arrived at Port Askaig and made our way south west to Bowmore, resisting the temptation to take the very short ferry crossing over the Jura and cycle up and down Jura’s only road. Islay has many distilleries, so large grain trucks passed us occasionally on the road but they were always careful to give you lots of room when passing on the otherwise fairly quiet roads. From Bowmore we took the ‘main’ road which runs right by the island’s airport and were lucky enough to see a plane land as we cycled along. After a few stops to admire the scenery on the island, we arrived at our B&B in Port Ellen just as the light was starting fade – we had also made it through the day without getting wet which was a bonus. 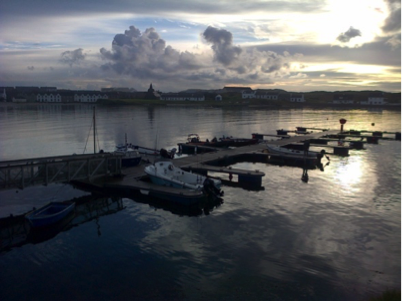 Evening meal was had in a local restaurant, preceded by a walk to admire the views and the stillness of the harbour area. Catching the ferry from Port Ellen in the morning, we arrived back in Kennacraig where we cycled to Tarbert to catch the ferry to take us over to Portavadie on the Cowal peninsula. 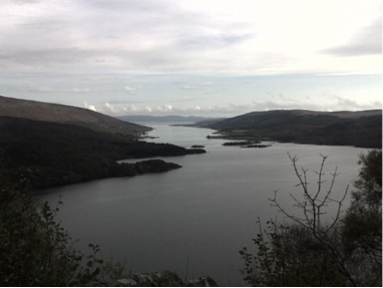 Cycling over to Tighnabruaich from Portavadie was a gentle introduction to the steep climb out of Tighnabruaich which gave some brilliant views over the Kyles of Bute and the Isle of Bute. A bit of huffing and puffing but we were rewarded with some great descents back to sea level at Colintraive. This was our best day in terms of the weather, clouds were high, the light was good and it stayed dry all day – not bad for October! The ferry crossing to Rhubodach on the Isle of Bute was the shortest ferry crossing of our trip and it was followed by a flat coastal cycle round to Rothesay bay where we dined outdoors on some fish and chips before catching our last ferry back to the mainland. Arriving in Wemyss Bay, we were then picked up and taken home, falling asleep in the back – a cracking trip!